Caetano Veloso penned this somber assessment of the rise of populist conservatism in Brazil shortly before the election of President Jair Bolsonaro. Brazil’s musical revolution in the ‘60s, led by Caetano Veloso, Gilberto Gil, Gal Costa, Tom Zé and Os Mutantes, explained through 20 of its most important albums (with audio). Moreno Veloso’s solo album Coisa Boa, his first after a 13-year break, celebrated Brazilian music from the 30s through the 70s and was an opportunity for the musician to create his own identity apart from his famous father. A high-quality live video of the Velosos performing “O Seu Amor” from the album Ofertório. We wanted to “shake the musical and cultural environment,” says Caetano Veloso of the movement he helped to found. What did you think? Tell us what's on your mind in the comments below and on social media using #caetano. Beautiful concert. Subtle and moving, the Veloso family conveys emotions throughout their well designed show. The lights and the set are nicely participating to the poetry. Amazing! 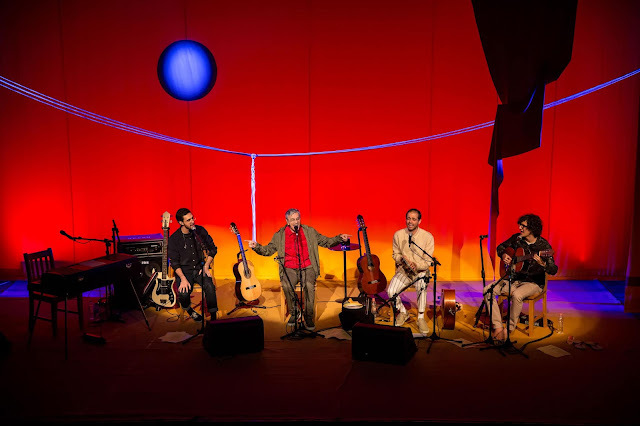 Another great show from Caetano Veloso. Could say there and listen to them for hours. Veloso family is talented. What a great way to start the weekend. Great concert! I enjoyed the veriety of music the Velosos played along with their family anecdotes and surprise dancing. The lighting rounded out the entire show, so simple yet captivading. A work of art just as their music. terrific hearing his sons! Hurray for reproduction. I wanted to hear COME AS U ARE. but fantastic concert otherwise. beautiful, they warmed my heart, they are super talented, Caetano is brilliant as always, his voice is intoxicating. LOVE THE SHOW !! LOVE THEM. I will go to listen to them again and again. I've been attending Caetano's concerts for 27 years. Each one was a uniquely faceted gem.